Live to Tell (Brazos 2002) is the first book we read for the directed study I'm doing this summer on evangelism. It's awesome, and I'll be using it a lot to frame my thinking and writing on the subject. A little background: I have only recently been able to draw the distinction between evangelism (which the Great Commission demands) and Evangelicalism (which implies an ideological/political agenda). I spent my freshman year of undergrad referring to it only as "the E-word." For a long time, I associated evangelism with theology that would deny me my calling to the ministry because I'm a woman, with methodology that felt like cultural imperialism. Those issues and more are certainly part of the conversation, but I'm learning not to let those associations color my understanding of the call to witness as much as they have in the past. Anyway. Kallenberg's book is great for framing a theological-philosophical approach to contextual evangelism. He pairs philosophy and theory with case studies to unpack the issues surrounding the question of how to share the Gospel in a world that is increasingly postmodern and post-Christian. Once, biblical literacy was widespread in America, and the moral authority of Scripture and the church could be assumed; neither is a given today. As the culture changes, our understanding of and approach to evangelism must change too. Belief is not just individual but communal. Sharing the Gospel requires not only translation but the teaching of a new language. Narrative is central to evangelism, belief and discipleship. Evangelism and discipleship cannot be separated. Conversion is time intensive and requires a paradigm shift. Conversion is less about intellectual assent than the participation in communal practices. Kallenberg's academic influences are what my professor called "canonical" to Duke Divinity School—thinkers like Stanley Hauerwas and Alastair MacIntyre. Kallenberg outlines and then challenges the assumptions of modernity (reductionism, individualism, representationalism and propositionalism), advocating a move beyond these to embrace a holistic, embodied approach to the theology of evangelism. I'm still thinking through the implications of Kallenberg's book, so I'll stop there and leave you with some some of his own words. "God's dealings with us are narratively shaped rather than theoretically driven. In other words, God sent us a gospel rather than a philosophical treatise!" "[O]ne cannot properly read the Bible until the biblical text ceases to become the object that one views and becomes, instead, the lens itself through which one sees." "[O]ur postmodern era reveals conversion to be a time-consuming—and time-redeeming—process." "Salvation may be more than adoption and socialization into this new family's radical way of life, but it is certainly not less." "Our words only have meaning insofar as we are engaged in doings." 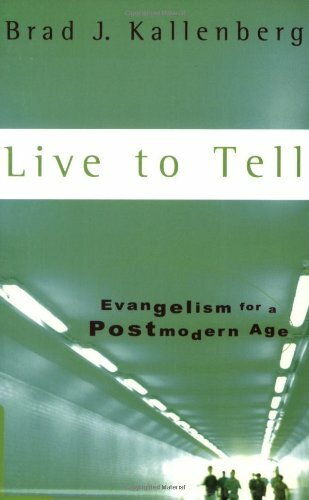 "[We must] expand our notion of conversion from assent to a set of propositions to fluency that engages one in a form of life." "If conservatives err by using Scripture as magic, liberals err by not taking the power of the Scripture seriously enough." "[O]ur fascination with objective truths can sometimes obscure the more urgent issue of how we stand toward such truths." "[A]nything worth doing is worth doing badly—until one can do it better." I Am a Person of Worth...Even without a Ph.D.